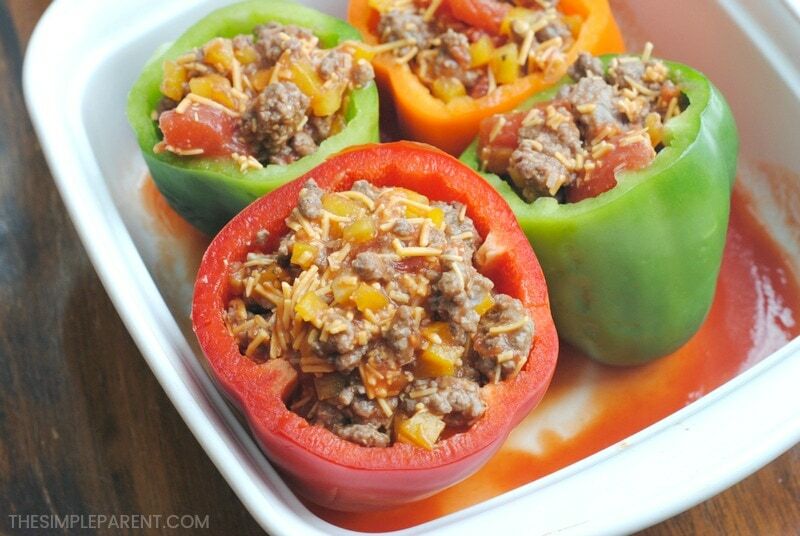 Home » recipes » Low Carb Stuffed Peppers without Rice Make Healthy Easy! Need an easy and delicious dinner idea but want to keep it healthy? 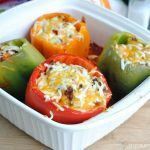 Try these low carb stuffed peppers! So many people I know are switching to a low carb or keto lifestyle and I see some of them struggling to keep variety in their menus. Others are having trouble finding family-friendly recipe options or recipes that are easy to make with familiar flavors! Our Low Carb Stuffed Peppers recipe is easy to make and meets all of the flavor cravings you might have! I love stuffed peppers. I don’t what it is about them but whenever I get a chance to have them for dinner, I’m on it. Crockpot Stuffed Peppers with uncooked rice is one of my favorite ways to make them because it’s super easy! But when I saw my friends looking for recipes to broaden their low carb options, I knew that stuffed green peppers could be changed into a more keto stuffed peppers recipe. So with a few tweaks, these stuffed peppers without rice fit the bill. Plus, they’re still super easy to make! Brown the ground beef (or turkey) in the minced garlic and diced onion and drain grease. In a large bowl combine the cooked meat, 3/4 cup of shredded cheese, diced pepper, Italian seasoning, tomato sauce, and diced tomatoes. Slice the tops off the pepper and scoop out the insides. Pour the reserved diced tomato juice into the bottom of an 8×8 or 9×9 baking dish. Fill each pepper with meat mixture and place in the baking dish. 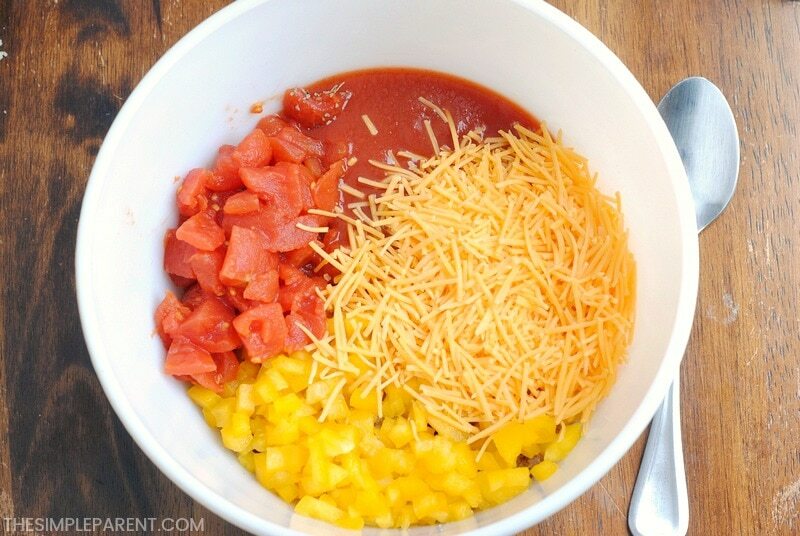 Sprinkle the top of each pepper with mozzarella cheese and remaining cheddar cheese. Bake for 20-25 minutes or until the peppers have softened. 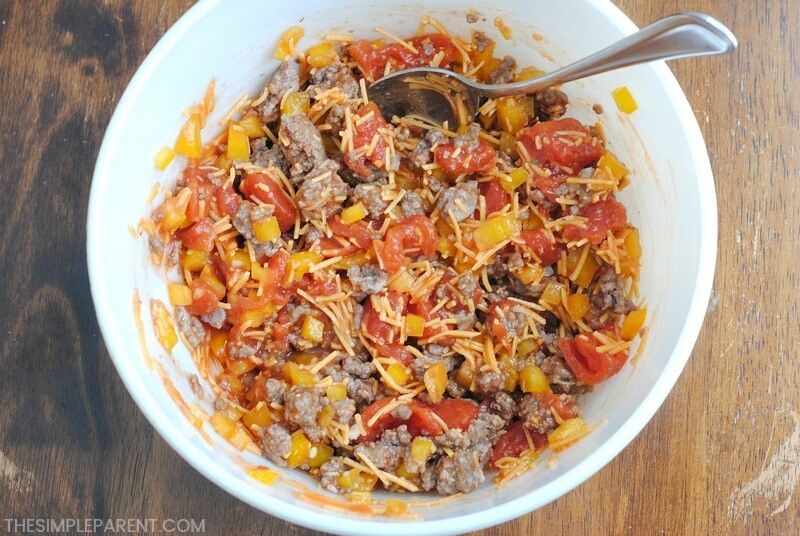 In a large bowl combine the cooked meat, 3/4 cup of shredded cheddar cheese, diced pepper, Italian seasoning, tomato sauce, and diced tomatoes. 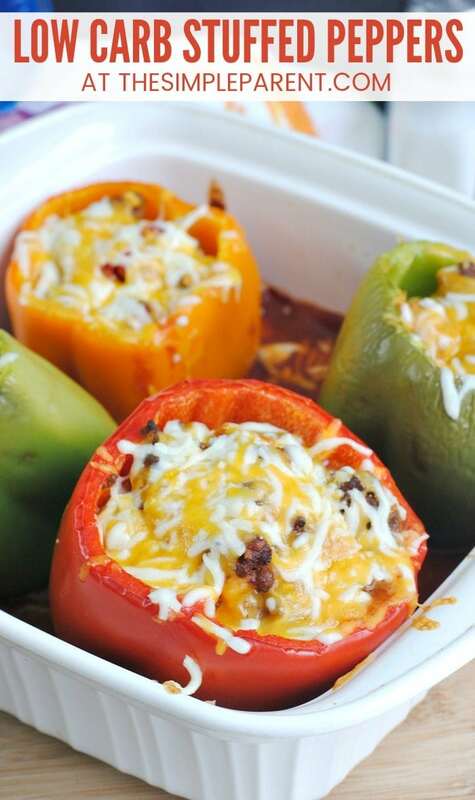 Making no rice stuffed peppers is a great way to get your entire family eating healthier. You can meet the need of your low carb lifestyle while still offering your kids the type of food that they’re familiar with eating! 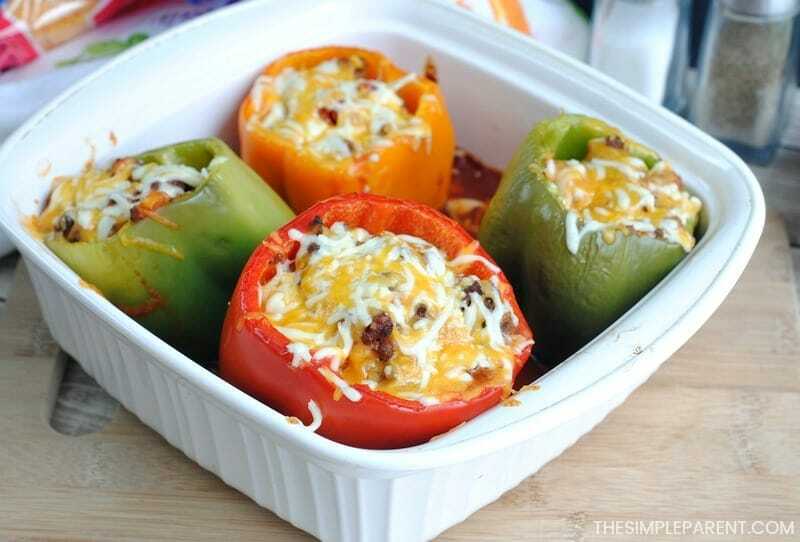 There’s no need to make more than one meal when you make these tasty stuffed peppers! For another low carb family-friendly option, try this baked spaghetti squash casserole! We love it! Your recipe says tomato paste in one ingredient list and tomato sauce in another. Then is says 2tsp Italian seasoning and doesn’t mention it in the steps and so therefore I completely forgot about it. Bummer. So we’ll see if it’s super bland. My apologies for the typos/omission in the printable version of the recipe! I have updated the printable recipe to match the steps written in the post. this is low carb but how many carbs are in each serving? ?